At PrimeStar, our real estate services include direction and advice for buying, renting, selling and letting property in Cyprus, assistance with home loans / mortgages / financing, insurance and legalities, taxation, visas/citizenships/residency, as well as property inspections for locals and international buyers. We cover all of Cyprus, including the regions of Nicosia, Limassol, Larnaca, Pafos and Famagusta, and usually opt for property exclusivity - sole agent representation - as this naturally boosts the promotion of the property and increases the likelihood of achieving better results. This is all backed by one of the largest online listings of properties in Cyprus, together with unrivalled digital exposure and other unique marketing campaigns. Whether purchasing your home or investing, buying property should be an exciting experience. Of course there also many aspects to consider, especially if you're not so familiar with the market and/or process. Careful and strategic consideration is required, as is a thorough understanding of market conditions, such as each location, proximity and accessibility, as well as current property prices. There are also of course many legalities involved - in place to protect both buyer and seller - that can sometimes seem overwhelming, particularly if this is your first property purchase. Backed by extensive industry experience, know-how and networks, PrimeStar are real estate experts that can help make the process easier and more efficient. With exclusive market insights, our agency offers invaluable direction, guidance and advice. Personal and exclusive care in buying: As a small boutique, family-run real estate agency, PrimeStar Estates make the property buying process comfortable and efficient, focussing on highly personal and exclusive services, together with a balance of traditional, local and modern techniques. This approach is essential when dealing with such personal matters and investment in valuable, longer-term assets. Whether looking for a home, apartment, luxury villa or commercial property in Cyprus, the key to locating and purchasing the ideal fit is knowing what you want; in-depth research and networking. At PrimeStar Estates, we carefully listen to your requirements and work with you to develop a detailed profile. This then allows us to better optimise what properties to investigate and present. Brief. First and foremost, clearly understanding buyer expectations and limitations. For instance what type of property are you seeking, budget range, special requirements, locations, lifestyle, special interest, investment, and more. Basically to establish which properties should be most suitable. Tools & networks. The next step is to utilise various tools and networks to filter and locate the most suitable/relevant properties. Having property exclusivity with many suitable properties puts PrimeStar in good stead to offer options that other agents simply cannot. The wider network available allows for many more options. At the same time, PrimeStar unleashes its team into the market to actively seek which other properties might also be suitable and considered as an option. Investigation. Not to be underestimated. Our team thoroughly inspects all properties prior to considering them as being an option. This ensures everything is in well working order and will allow for smooth transaction. Obvious factors taken into consideration include title deeds, property condition and work required, infrastructure, neighbourhood urban planning, among other. Property inspection. PrimeStar helps guide clients through this process, highlighting areas that should be prioritised, and pinpointing any necessary detail. The goal is to ensure clients purchase property that they are both happy and secure with. Negotiations. Each buyer should know their budget. And whilst many buyers know how to negotiate themselves, others are not at all comfortable with this process. Regardless, a real estate agent should be appointed to handle negotiations; always together with their client. Estate agents have the day-in, day-out experience in dealing with such matters, understand true property and market values in Cyprus, and understand how other agents operate. Such insight and experience is invaluable in achieving best terms. Remember, as your agent, PrimeStar always act in your interest to ensure you buy property at the best possible price. Sale and legalities. Once the perfect property has been selected and negotiated, PrimeStar helps complete the transaction process, handling all legalities and paper work. This part is no doubt one of the most daunting for buyers, as well as one of the most important in order to protect your interest. PrimeStar can also connect you with the financial support you might need to complete the transaction, including tax depreciation specialists - particularly useful if you are buying property as an investment - finance brokers, and banks for home loans and mortgages. PrimeStar Estates offer a superior level of service that is both professional and personal. This comes with a long-standing and thorough understanding of the Cyprus real estate market, specialisation in property exclusivity and luxury estates, and a balance of traditional and modern approaches. Customer loyalty: The proof of quality and personal service is in return customers and in customers who refer PrimeStar Estates onwards. Indeed, word-of-mouth is a powerful sales and marketing channel in strong community orientated markets such as Cyprus. PrimeStar typically generate a large percentage of their business from past customers and referrals - the perfect indication of trust. Selling your property does not have to be difficult. In fact, it can be a quite easy and even an exciting adventure. For sure there are many things you can do to make the entire process smoother and more efficient, whilst achieving the best return possible. From assigning the right real estate agent as your property representative, establishing the best and most accurate value of your property, better preparing your property and sprucing it up, to proper and localised marketing, promotions and sales (closing the sale). Personal and exclusive care in selling: As a small boutique, family-run real estate agency, PrimeStar Estates make the property selling process comfortable and efficient, focussing on highly personal and exclusive services, together with a balance of traditional, local and modern real estate selling techniques. This approach is essential when dealing with such sensitive investment home affairs and investment in valuable, longer-term assets. 1. Digital/online channels; agent's own website (credible, strong online presence, useability), social media platforms with existing large following, third party websites, and email contacts, among other. All these channels promote your property on the fastest and most used medium nowadays. 2. Offline marketing & promotions; in a smaller real estate market such as Cyprus, many offline marketing initiatives still work well. Consider banners and billboards, campaigns in publications/magazines/newspapers, office/store-front, events, and especially personal contact/word-of-mouth. 3. Existing & growing database of buyers to match with sellers; our CRM (Customer Relationship Management) database is exhaustive, and continues to grow daily. This means we already have a comprehensive pool of possible clients to match with your property. 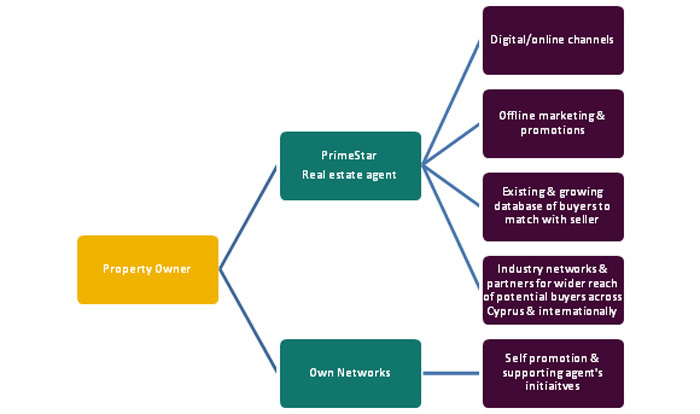 These possible clients have already approached us seeking to buy property in Cyprus, so they are already qualified leads, and in fact, existing PrimeStar clients. 4. 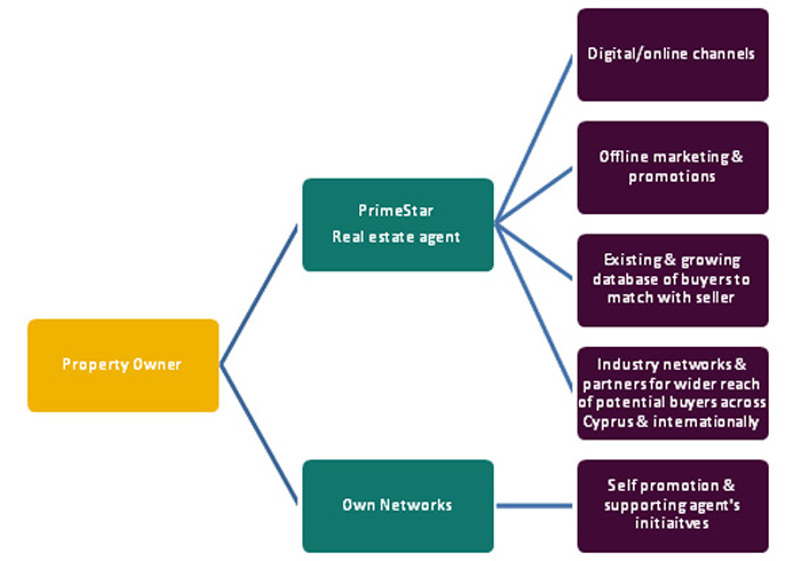 Industry networks & partners for wider reach of potential buyers across Cyprus & internationally; such is the nature of the real estate sector, in Cyprus and globally, that we work closely with other (selected) agents and partners to increase a property's reach and maximise the possibility of a sale. Consider estate agents in other cities or countries, who have themselves their own client base, or consider legal advocates and accountants, who have clients seeking certain professional services (i.e. Cyprus citizenships/passports, corporate business services, wealth management), and would also be interested in investing in real estate. Finding the right agent to sell your property is imperative, as it not only achieves your ultimate goal, but makes the entire transaction process easier. Choose an agent that has both the means (distribution channels) and ability to achieve your goals, as well as the desire and motivation to focus on your needs. There are many factors to consider when selecting which agent to sell your property. Property exclusivity in selling really does work for you - the agency pays special attention to your property! Providing property exclusivity to one agent, at least for the first few months it is on the market is highly recommended and can most times be a competitive advantage to selling your property faster and with greater ease. Basically, the agent you select is given property exclusivity, therefore is the only one dealing with your sale. This then makes them fully focussed and committed to your property, as they too reap most reward from such an agreement. No doubt, real estate agents always prioritise properties they have exclusivity with, as only they can receive the sale commission. They will do their upmost to sell the property in the given time period and before it is put on the wider market, i.e. with other real estate agents. Furthermore, having only one agent and one point-of-contact is a lot more personal and direct, making the entire selling process easier to handle logistically. In any case, real estate agents have themselves a wide network of distribution channels that increase your property's visibility, so just because it is listed with one agent, does not mean its reach stops here. Renting might seem easy enough to find a place on your own, and normally should be. But dealing via an agent ensures your interest a protected, such as with contract lease terms, and following up on aspects that matter most. The majority of properties listed on PrimeStar-Estates.com are long term rentals, typically for 6 and 12 month contract agreements. This can be extended or arranged for a longer fixed term, which may very well allow you to negotiate a lower price. Long terms rentals are available throughout Cyprus, including the districts of Nicosia, Larnaca, Pafos, Limassol, Polis and Famagusta districts. Properties range from detached houses, houses with land, apartments/flats and townhouses/maisonettes. PrimeStar Estates also specialises in Luxury villas and apartments for rent, with property exclusivity preferred on most listings. In others words, available only via PrimeStar Estates. There is also a selection of properties for shorter terms rentals, such as a few months or weeks. These can be a great option for holiday rentals, visiting students, as well as moving between homes or for those who prefer to experience and better understand the area before committing to longer terms rentals or even buying property in Cyprus. Indeed, renting in Cyprus is an excellent way to first know the destination before buying and relocating. Customised solution to renting in Cyprus. Speak to an expert. Remember: in Cyprus, estate agents offer you a FREE rental service. Real estate agents do not make any commission from you for helping to find a rental property. They take their earnings from the first month rent from the landlord letting out the property. So it costs you absolutely nothing to have an expert such as PrimeStar Estates do the running around work. Have you considered letting out your property to generate income or help pay the mortgage? There are many issues involved with letting in Cyprus, from preparing your property, marketing, finding the right tenant, maintenance and legalities. If done properly, renting can be a rewarding option for your asset. Much like the selling process, PrimeStar Estates can help you to let a property in Cyprus, offering direction and guidance on how to achieve the best rental price from a reliable and stable tenant, as well as understanding all legalities involved, including your obligations to your tenants, and your tenant's obligations to you. Planning your approach is the best way to start. First consider what type of tenant you are targeting. Be realistic and consider your location and property type. For instance, are you close to a university in order to attract students, or is it a large house with many bedrooms that would appeal to families. Then, customise your property to better suit this type of tenant, but at the same time keep things neutral and depersonalised in order to keep your options somewhat open. Plan your budgets carefully. Research the running costs of the property (i.e. mortgage, preparations, maintenance, insurance fees, solicitor fees, estate agent fees) and set rental value accordingly. Make sure you have access to funds to make essential repairs if and when required. It will put you in a much better position to retain a satisfied tenant. Marketing and promoting your property to let. There are of course many things you can do to let your property, such as a billboard sign with telephone number at the front, listings online and in newspapers. However, you should never underestimate the workload involved in successfully letting your property. Appointing an agent to take care of all this is faster and hassle free. Not to mention the power of word-of-mouth in Cyprus. An established and well known estate agent can boost your options of letting. Tenants almost never want to spend extra to fix the house or flat they are renting, therefore never use their imagination to look beyond the surface. What they see is what they get. Rental income is also an investment. However, having your property well maintained does indeed boost the total value of the asset, for later rental and for a possible future sale. So, before you begin the process of letting your property, make sure you are well prepared in order to increase your chances of letting, letting early, and letting to the most reliable tenant. Comprehensive commercial, industrial, office and retail real estate and property listings covering all regions in Cyprus, including: Nicosia, Larnaca, Limassol, Pafos and Famagusta. Let PrimeStar represent your interest and optimise results with your commercial, industrial, office and retail real estate. A long-standing history in commercial real estate, thorough understanding of market trends and economic activity, as well as the right distribution channels to cater. Above all, PrimeStar offer unique personal and exclusive service, fully customised to each client. Selling or letting you commercial property throughout all regions in Cyprus, including: Nicosia, Larnaca, Limassol, Pafos and Famagusta.